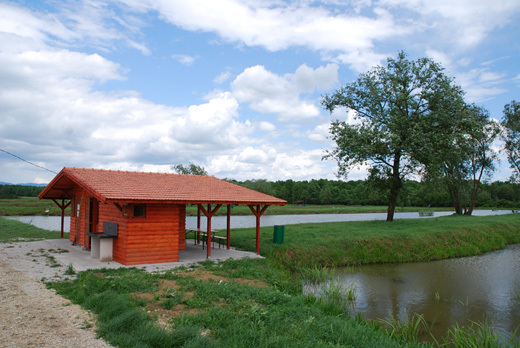 Fish farm Kupa in Draganić offers sport fishing in beautiful natural surroundings not far from Zagreb. Four sport fishing ponds with the surface of 4 ha are cultured with quality fish, such as the famous carp of Draganić, pike, catfish, grass carp, bighead carp, tench, zander. Opening hours of the sports fishing ponds: Friday, Saturday and Sunday from 6 a.m. to 8 p.m. in the summer, and 7 a.m. to 5 p.m. during winter. Within the sport fishing ponds there is a log-cabin with a bar and toilets. You can visit us by appointment as well as on working days (+385 91 4886 588). On sport fishing ponds you can fully relax and enjoy the intact nature! Daily ticket fishing permit for Garbolino Lake is HRK 60.00 kn. Ticket for children under 15 is HRK 30.00 kn. Access by car and motorcycle to sports fishing ponds area is prohibited. All fish can be caught and set free, as well as caught and bought in line with the price list. Receipt will be issued accordingly. Fishing is allowed solely form the fishing platform. You are obliged to set free carps and grass carps over 4 kg, golden carps, sterlets and tenches. It is obligatory to use pads, unhooking mats and disinfectant spray (in case you are setting fish free). You are allowed to fish only in front of you. You should not throw on your left or right as not to disturb other fishermen. It is forbidden to throw cigarette butts in the water. It is forbidden to feed fish with old food, mouldy boiled fish or dry maize. Disinfection of keepnets and unhooking mats before fishing is obligatory (disinfection is carried out by Garbolino Lake manager). If you would like to take a picture with a caught fish, and set it free after that, minimum length of the keepnet is 3 m. One keepnet can hold a maximum of 15 carps. It is forbidden to catch fish using all kinds of nets. It is forbidden to catch fish using live fish. You are allowed to catch fish with a maximum of 2 fishing rods with a reel, using one hook in the system. It is forbidden to use conductors (lines). Sports fishing ponds manager is allowed to inspect your equipment and bags in the pond area at any given moment. It is forbidden to leave litter on fishing positons. It is forbidden to swim and carry baits into water. It is forbidden to start a fire, as well as prepare barbecue on fishing locations. Should you see any visitors behave in an unsportsmanlike manner, please report this person to the manager, and you will be rewarded. Catch fish at your own risk. Opening hours 6 a.m. to 7 p.m. (in the summer), 7 a.m. – 5 p.m. (in the winter).